A man sits in the destroyed, former Assembly Hall of the Governor of Saada. 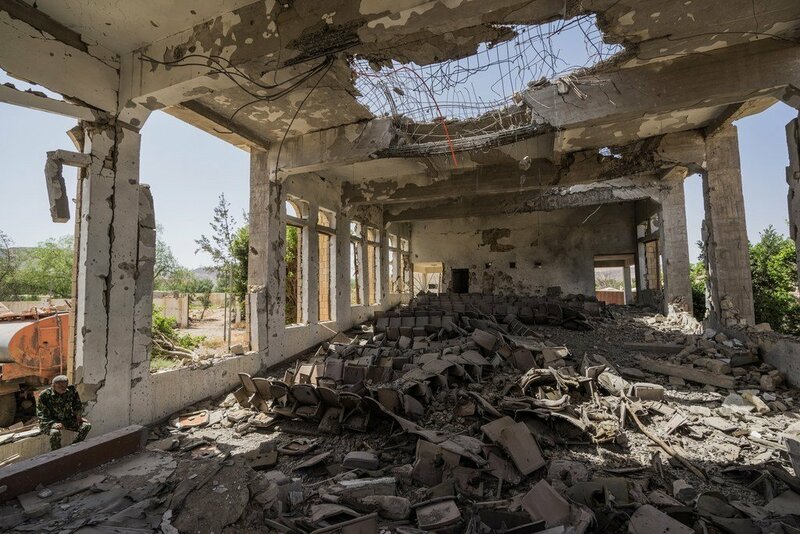 Since the escalation of conflict in Yemen, millions have been forced to rely on life-saving assistance and much of the country lies in ruins. Highly anticipated UN-brokered consultations about substantive talks which could lead to an end to more than three years of brutal conflict across Yemen, have begun in Sweden. Brutal fighting has left the Middle East nation divided between Government and rebel forces, with millions on the brink of famine, and the economy and society in ruins. UN Special Envoy for Yemen, Martin Griffiths, on Wednesday extended his “appreciation to the Government of Sweden for hosting the political consultations, and the Government of Kuwait for facilitating the travel of the Sana’a delegation” to the talks, referring to representatives of the Houthi rebel movement, who were allowed to fly out of the Yemeni capital a few days ago. The UN attempted to bring the parties together – the Houthis and officially-recognized Government delegation – in Geneva in September for consultations, but conditions to allow the Houthi delegation to reach the Swiss city, did not materialize. 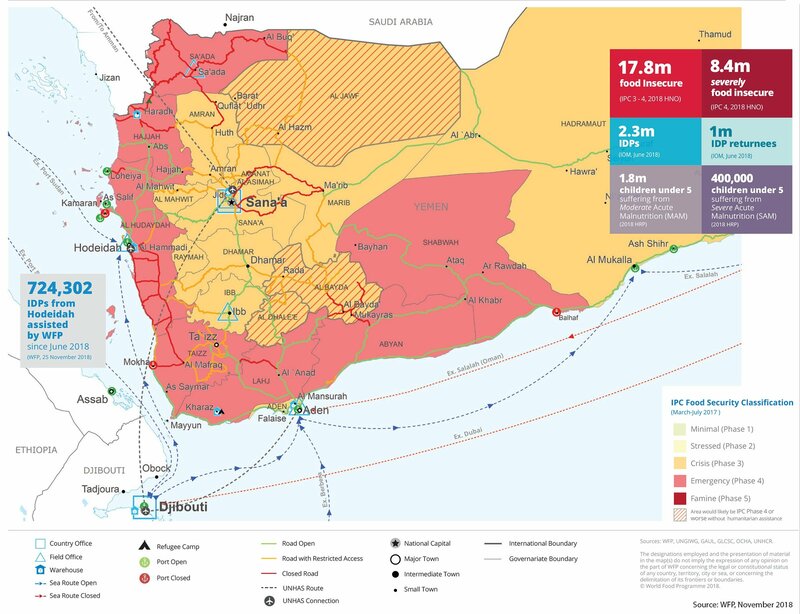 Across Yemen, more than 22 million people – over three-quarters of the population – are dependent on humanitarian assistance or protection, of whom over 8 million are severely food insecure and at risk of starvation. The conflict, which escalated in early 2015, following a Saudi-led military intervention against a Houthi rebel insurgency, at the request of the Yemeni Government, has also wrecked the country’s medical, water and sanitation systems, resulting in multiple outbreaks of cholera and other deadly diseases. Thousands of civilians have also perished in airstrikes and fighting. According to the UN Office for the Coordination of Humanitarian Affairs (OCHA), all parties to the conflict display a disregard for international humanitarian and human rights law and have impeded the principled and timely delivery of humanitarian assistance. Prior to Mr. Griffiths arrival in Sweden, a UN chartered aircraft successfully evacuated some 50 badly injured Yemenis from the opposition-controlled capital, Sana’a, to medical centres in Oman for treatment, a development seen as a critical confidence-building measure, ahead of the talks. Top officials from many nations also welcomed the medical evacuations. While there have been many regional and global attempts to silence the guns in Yemen, bringing the parties together and finding agreements has been challenging. Mr. Griffiths was appointed the Special Envoy in February this year, succeeding Ismail Ould Cheikh Ahmed, who had shepherded the UN’s efforts to resolve the conflict in Yemen since April 2015. In his last briefing to the Security Council Mr. Ould Cheikh Ahmed cautioned that a “destructive pattern of zero-sum politics” has continued to plunged Yemen into ever deeper poverty and destruction, emphasizing that while the UN and the wider international community can try to bring about a favourable environment for a path to peace, Yemeni decision-makers must stop the fighting and bloodshed. Humanitarian aid agencies, which have been providing life-saving assistance to millions across Yemen, have underscored the urgency of talks, warning that the situation on the ground has deteriorated “dramatically” in recent months. This message was reinforced by the Principles of the Inter-Agency Standing Committee – a group of agencies including many UN entities, international organizations and non-government organizations. With three-quarters of the population requiring some form of basic assistance to survive, the humanitarian crisis in Yemen, now in its fourth year, has reached unprecedented levels of need. On Monday, ahead of the United Nation’s 73rd General Assembly high-level debate, a special event will focus on the humanitarian response across the country, its major achievements and its daily challenges, in an attempt to galvanize more international support.